Perhaps the most important discovery ever to made in the world of physics was Einstein’s theory of relativity and his famous equation E = mc2. The equation reveals that 1 kilogram of matter corresponds to 25,000,000,000 kWh of energy, which could power a town for 3 years or a car for 100,000 years. The equation shows that energy and matter are different manifestations of the same thing. It shows that there is only one substance “energy-matter”, which has a dual nature and can manifest as energy or matter. The same can be said about light, which can either display the behaviour of a wave or the behaviour of a particle. This does not mean that light changes back and forth between waves and particles at will, but that it is in some intermediate state which can express both aspects simultaneously. It is possible that sub-atomic particles of matter are actually standing waves of energy. Low frequency waves vibrate slowly and behave like matter, and high frequency waves vibrate rapidly and behave like energy. This clearly has some similarities with “string theory” where everything is believed to be composed of incredibly minute (10-33 centimetres long, or about a millionth of a billionth of a billionth of a billionth of a centimetre) strings or loops of energy-matter vibrating in ten dimensions. Our brains can only comprehend four dimensions – the three spatial dimensions (length, width and height) and one temporal dimension (time). So there may be six hidden spatial dimensions. The cosmologies of eastern religions are based around seven planes of existence with our physical plane being the lowest. Of the six higher planes, some are said to be composed of subtle matter and some of pure energy. So it seems that modern physics is beginning to discover what has been known in the East for millennia. As we have just discussed, some of the current theories of fundamental physics state that there are hidden spatial dimensions beyond the three that we live in. It is impossible to even imagine what a higher dimension would be like, but to get some idea think of Dr Who’s TARDIS, which was bigger on the inside than it was on the outside. Or you could imagine a house with a special room that is much bigger than the whole house – the room is so big in fact, it is the size of a mansion. Then imagine that this mansion also has special rooms which are the size of even bigger mansions, and so on. I believe this is what Christ was referring to when he said, “In my father’s house are many mansions” (John 14:2). We know that God lives in heaven, so Christ is saying that the heavens are multi-dimensional and that each higher realm is more expansive than the last. Think about it – could you come up with a simpler description to explain a multi-dimensional universe in a non-scientific manner to the people of 2000 years ago? Studies on the rotation of stars around galaxies have shown that 96% of the universe is unaccounted for. In theory, stars on the outer rim of a galaxy should not be able to rotate as fast as those near the centre, because the increased centrifugal force would cause them to fly off into outer space. However, it has been found that stars on the rim of a galaxy do rotate just as fast as those in the centre, which contradicts the laws of physics! So scientists had to come up with a new theory that would take this into account. The mass of all the visible matter within a galaxy only provides 4% of the gravitational field that is required to stop it from literally ripping itself apart. So why aren’t all the galaxies flying apart? In the mid 1970s physicists and astronomers started looking for the missing matter of the universe. They called it “dark matter” because it is not visible. More recently the discovery of vast spherical energy auras, which totally encircle the galactic disc, indicates the presence of a large mass of dark matter and dark energy outside the galactic nucleus. Dark energy is a hypothetical form of energy which permeates all of space and has strong negative pressure, which explains the accelerating expansion of the universe. It is a relatively new concept that forms part of the “Standard Model”, which states that the universe is composed of approximately 4% visible matter, 23% dark matter and 73% dark energy. This dark matter and energy is the energy-matter of the aforementioned higher planes of Hindu and Buddhist cosmologies and the hidden spatial dimensions of string theory. Quantum foam, also known as space-time foam, is a concept in quantum physics proposed by Nobel physicist John Wheeler in 1955 to describe the microscopic sea of bubbling energy-matter. The foam is what space-time would look like if we could zoom in to a scale of 10-33 centimetres (the Planck length). At this microscopic scale particles of matter appear to be nothing more than standing waves of energy. Wheeler proposed that minute wormholes measuring 10-33 centimetres could exist in the quantum foam, which some physicists theorise could even be hyper-spatial links to other dimensions. The hyper-spatial nature of the quantum foam could account for principles like the transmission of light and the flow of time. Various scientists believe that quantum foam is an incredibly powerful source of zero-point energy, and it has been estimated that one cubic centimetre of empty space contains enough energy to boil all the world’s oceans. If we could describe a microscopic standing wave pattern that appeared particle-like and incorporated a vortex within its structure, we might have a theory that could unite all the current variants in modern physics. Leadbeater and Besant explain that each subatomic particle is composed of ten loops which circulate energy from higher dimensions. Back in 1895, they knew that physical matter was composed from “strings” – 10 years before Einstein’s theory of relativity and 80 years before string theory. The structure of energy-matter may have been known for over 100 years, yet completely ignored by conventional science. Cosmic inflation theory states that the universe is not expanding into space; rather space itself is expanding, dragging stars and galaxies in its wake. A simple analogy is that of a balloon, representing space-time, with some dots drawn on it to represent the galaxies. When the balloon is inflated the dots move further apart. So the big bang wasn’t matter exploding to fill empty space– it was matter, energy and space expanding together into an endless void of nothingness. But where did all the matter come from? The theory of relativity states that matter can neither be created nor destroyed, so if it wasn’t created it must have been transformed into matter from energy. But where did the energy come from? It must have always been there and was just reawakened or recycled in the big bang. Ancient eastern religious texts state that the universe goes through cycles of “in-breaths” and “out-breaths”. Generally with an explosion there is an initial rapid expansion followed by a gradual slowing down. Not so with the universe – its expansion is accelerating, 14 billion years after the Big Bang! The reason for the acceleration seems to be an increase in the quantity of dark energy, which produces a vacuum effect resulting in evermore rapid expansion. This subsequent influx of energy from a higher source is clearly not what we would expect from a typical explosion. So the Big Bang appears to be under some sort of external control – perhaps the mind of God? 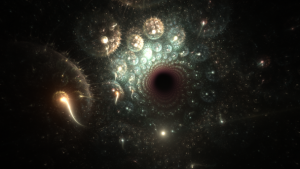 If we stay with the assumption that dark energy exists in higher dimensions, it seems that there has been a rush of energy descending into the physical dimension (the out-breath) and that at some point in the future it will return to the higher dimensions and the physical universe will contract or dissolve (the in-breath). What existed before the universe began, and what, if anything, will exist after the universe ends? Scientists believe that our universe exists within a metaverse (meta-universe). The metaverse is timeless and eternal because it is an absolute void and totally unmanifest. Kabbalah has a term that exactly corresponds to the metaverse: “Ain” is the infinite nothingness; the void; non- existence; the eternal empty background; the zero. The universe is widely believed by scientists to have originated from a singularity, a single point that contains the infinite potential of the universe. Once again Kabbalah has an equivalent term: “Ain Soph” is the limitless (potential); the absolute source of creation; the one. The Hindu term “Brahman” has the same meaning: God unmanifest; the transcendent reality that is the source of all being in this universe; the singularity from which “all that is” originated, including space and time. Our universe has been compared to foam floating on a sea of zero-point energy – an energy so enormous that many physicists ignore it and leave it out of their equations. Zero-point energy is believed to exist at every point in the universe, even in empty space, yet is currently undetectable because it seems to lie just beyond our reality. No prizes for guessing that Kabbalah also has a term to describe it: “Ain Soph Aur” is the infinite light; the infinite energy that manifests our universe. The ancient terms directly correspond to those used in modern physics, so once again science is catching up with ancient spiritual knowledge. Some physicists have suggested that the force of gravity is much weaker than the other forces because it leaks out into hidden dimensions, so that we only feel part of its effect. I suspect the reverse may be true and that gravity originates in a higher dimension and leaks down into our reality, because if it originated here “gravitons” (theoretical particles) would be real and detectable rather than just hypothetical. Science finds it impossible to explain non-physical phenomena such as magnetic fields in physical terms. Magnetic fields are clearly not based upon physical particles because, like gravity, they exert a force even in a vacuum (where no physical particles are present), so scientists have to come up with imaginary particles like “virtual photons” to explain the phenomenon. As with gravity, I believe that magnetic forces originate in higher dimensions and only their effects can be felt in our physical dimension. Extra dimensions are the only logical way to explain all non-physical phenomena. Physicist Paul Wesson and his team at the University of Waterloo in Canada have calculated that our entire universe could be the inside of a higher-dimensional black hole. The theory provides a better description of the beginning of the universe than the big bang because it accounts for the creation of matter. In Wesson’s model, energy from the higher-dimensional universe streams down from the higher universe and condenses to form the matter of our universe. Wesson’s model also predicts that a collapsing universe would bounce back just before it became a singularity, and begin expanding again. This is consistent with the Hindu belief that the universe goes through cycles of “in-breaths” and “out-breaths”. Wesson is now considering the idea of “Russian doll universes”, with each world embedded in another higher dimensional world, which is exactly how esoterics describe the universe.